Tres Valles Lodge: It’s no secret that Tres Valles Lodge is a must-fish destination in Patagonia. With ingredients like an attentive host couple, eager staff / guides and inexhaustible walk-and-wade fishing in the shadow of the Andes, a recipe for success is inexorable. Situated in a remote corner of Chubut Province near Chile, Tres Valles Lodge is ideal for those fishermen who don’t like to “follow the crowd” and want an intimate, small capacity lodge experience. With non-fishing activities available, it is a great choice for those with a non-fishing companion. 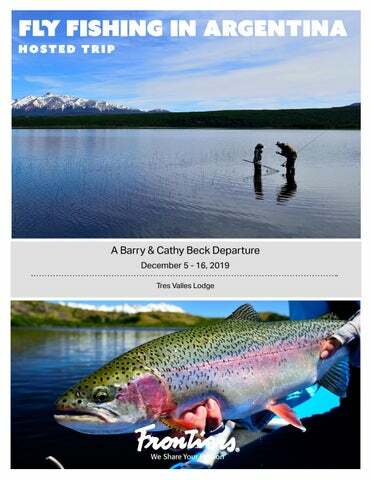 About Barry & Cathy Beck Longtime Frontiers trip hosts and photographers, the Becks travel far and wide to follow their love for fly fishing and nature photography. Based in Pennsylvania, Barry and Cathy write books, host fly fishing departures, lead African photo safaris, and operate a stock photography business. The Becks are well-known in the fishing, photography, and travel industries, and possess a stellar reputation for their skill, knowledge, and expertise born out of a 20 year career. Their books include Cathy Beck’s Fly Fishing Handbook, now in its third edition; Fly Waters Near and Far, Fly Fishing the Flats and a coffee table book of photographs from around the world. Depart your hometown via overnight commercial flight service to Buenos Aires. Arrive Buenos Aires, Ezeiza International Airport. Upon arrival, clear immigration and collect your luggage. Once you exit the airport, you will be met by an English-speaking guide / driver and transferred to the Loi Suites Recoleta Hotel. Hotel room accommodations will be arranged on your behalf for one night, inclusive of buffet breakfast. Spend the remainder of the day at leisure in Buenos Aires, meals on your own. At a prearranged time, your guide / driver will meet you at the hotel, transfer you to Aeroparque Domestic Airport and assist with check-in for your flight to Esquel. Upon arrival in Esquel, a lodge representative will meet you to assist with luggage and provide your transfer to Tres Valles Lodge, about a 3-hour drive. Once there, you will be welcomed by your hosts, Simon and Guillermina and the entire staff. Settle in and enjoy a meal while taking in the beauty of the surroundings. This evening, enjoy cocktails, dinner and overnight accommodations at Tres Valles Lodge. Enjoy six days fishing the program of Tres Valles Lodge which includes the Rio Pico, Rio Pampa, and the Rio Nilson. These rivers hold good numbers of brown and rainbow trout that readily take dry flies on light tackle. You will work the cut banks, riffles, runs and pools for feeding trout that are not as educated as you might think. You may also opt to fish one of several spring creeks in the area where stalking trout and casting small flies are the keys to success. You will also have the opportunity to float several local lakes. After breakfast and time for packing, your guide will provide a private transfer to the airport in Esquel (about a 3-hour drive) and assist with check-in for flight service to Buenos Aires. Note: For any other incidental expenses incurred during your stay at Tres Valles, U.S. currency are preferred. Depart Esquel. Arrive Buenos Aires, Aeroparque Domestic Airport. Upon arrival, your English-speaking guide / driver will meet you and provide private transfer to the Loi Suites Recoleta Hotel. Hotel room accommodations will be arranged on your behalf for one night, inclusive of buffet breakfast. Remainder of the day at leisure in Buenos Aires, meals on your own. Overnight accommodations at the Loi Suites Recoleta Hotel. Depart Buenos Aires. Spend the day at your leisure in Buenos Aires. At a pre-arranged time you will be met and transferred to Ezeiza International Airport where you will check in to your flight back to the USA. Inclusions: All-inclusive fishing arrangements (accommodations; all meals, beverages with lodge / program meals; transfers to / from lodge / river, and one guide per two anglers). Exclusions: Round-trip transfers to / from Esquel airport / lodge; Buenos Aires hotel accommodations; transfers to / from airport / hotel; meals where not indicated; tourist and departure taxes, special transfers, extras (room service, telephone calls, laundry, tips, guide gratuities, personal gratuities, alcoholic beverages except where specified by lodge), local fishing license, and airfare. In addition to providing a superior experience while youâ&#x20AC;&#x2122;re fishing in South America, the Airline Department at Frontiers can coordinate all of your travel logistics to and from Buenos Aires. Copyright © 2016. Frontiers International Travel. All rights reserved. The air holidays and flights in this brochure are ATOL protected by the Civil Aviation Authority. Our ATOL number is ATOL 3315. Copyright © 2016. 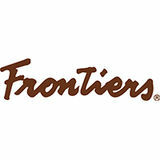 Frontiers International Travel. All rights reserved.